In this project, we present a domain adaptation approach based on a two-step learning to detect landmarks on human and animal faces. 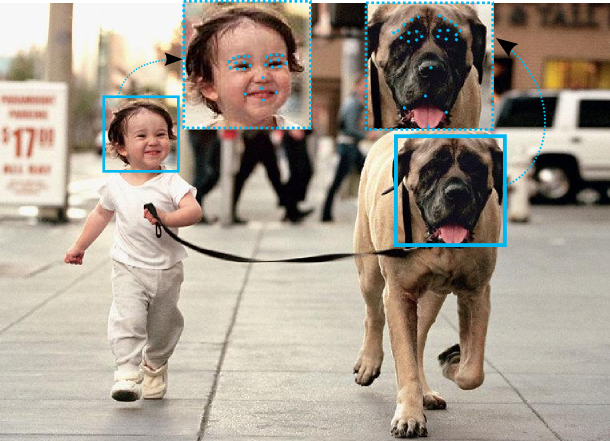 The method builds an landmark detector by performing two tasks: i) learning to detect landmarks in a supervised way by using labeled data of human faces (source domain) and ii) learning to reconstruct non-human faces with unlabeled data (target domain). The final representation of our method preserves the discriminability from the labeled data and encodes the landmarks locations of the target domain. This capability suggests that the performance of our method stems from the creation of a single representation that encodes the structure information of non-human face and relevant features for the landmark detection on the human faces. on Faces in Different Domains, IEEE International Conference on Image Processing (ICIP), 2018. Visit the page for the code and paper access.